Yellow with glints of silver, this wine is luminous. This wine is rich and complex, and must be given the time to open in order to take full advantage of all its qualities. Initially the nose is full of fruit, with notes of mirabelle and citron. As it breathes, the white flowers are fully expressed – honeysuckle, may and lime blossom. Notes of furniture polish too, of honey and beeswax enter to complete the aromatic palette. The sensation of harmony continues in the palate. The attack is both supple and fresh, almost aniseed with notes of fennel and star anise. Subtle notes of fresh hazel nuts, turmeric and saffron somewhat reveal its vinification and élevage. However, the finish keeps the fresh, balanced notes that make our Hermitage a real success – harmonious and appealing. It can be drunk on its own, now and for the next five years or so, accompanying white-fleshed river fish and saffron or lemon sauces. Trout with almonds, for example, pike-perch or sweetbreads. 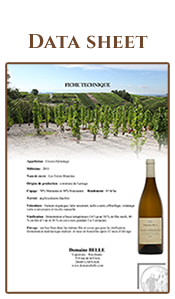 For more information on this wine and / or to apply for prices, please contact us via our contact form.